PHILADELPHIA (WPVI) -- In a few months, when you are visiting New York City and craving an authentic Philadelphia soft pretzel, you'll be in luck. 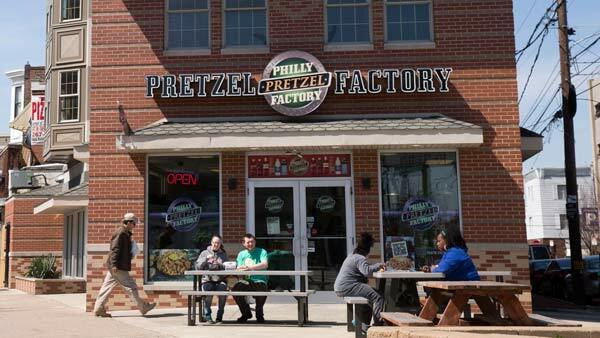 Philly Pretzel Factory is planning to open multiple stores in the Manhattan area. The stores will begin to pop up beginning next year. But will Big Apple residents like having the Philly staple in their neighborhood? "New Yorkers love us! When we do shows at the Javits Center, people line up before we even open and tell us that we give them the best pretzel experience in their lives and they look forward to seeing us in NYC," Tom Monaghan, Philly Pretzel Factory Chief Development Officer, told Action News. In 1998, Dan DiZio and his college roommate Len Lehman opened the doors to the first Philly Pretzel Factory in the Mayfair section of the city. "The store was so successful that in the second year, potential franchisees were approaching him to start franchising his concept," the company's website reads. As of 2017, there are 172 total Philly Pretzel Factory locations, with 87 in Philadelphia and surrounding counties. Other locations outside Philly include Las Vegas, Cooperas Cove in Texas, Dallas in Georgia, and Surfside Beach in South Carolina. "We'd like to continue U.S. expansion and have locations in every state before developing internationally," Monaghan said. The Manhattan expansion will be run by Gotham Food Service, a group of NYC based entrepreneurs and operators. "The brand is expanding at more than 40 stores each year, so we are always looking for excellent franchisee partners all across the country. The Gotham team brings a wealth of experience and knowledge to our franchise systems and we're looking forward to their developing of New York City," Monaghan said. Gotham Food Service says they were looking at several food concepts to bring to Manhattan and found Philly Pretzel Factory too good to pass up. "There are a few other pretzel options in Manhattan but none of them offer the classic Philly style hot soft pretzel, at affordable prices. Philly Pretzel Factory has a proven playbook, an amazing corporate team, and history of success in a wide variety of market types. Every 10 blocks in Manhattan has a different market dynamic so this experience will be invaluable," Gotham Food said. Gotham Food Service says they expect to be one of the largest Philly Pretzel Factory franchisee owners from a store count perspective within three years. They say there are many Philadelphians living in NYC who already love the product. And for the others, they'll love it when they try it. "For those who don't know us yet, we're confident they will enthusiastically gravitate to our pretzel compared to the other NYC alternatives that are either served cold, or taste more like a sugary doughnut than a true pretzel that is baked fresh, served warm from a convenient location and are meant for sharing!" Gotham Food Service said. Philly Pretzel Factory recently moved its headquarters to Bensalem, Bucks County earlier this year, which Monaghan said was very beneficial. "There's great benefit bringing all operations under one roof which helps us to better service our franchisees," Monaghan said. Another question remains - will New Yorkers eat their Philly soft pretzels with mustard? "We will see!" Gotham Food Services said. "New Yorkers are unique. Spicy mustard on pastrami is a big deal in NYC. In any case, we offer nine different topping for pretzels that include four unique mustards, chocolate, cheese, cinnamon, or buttercream." Mustard or not, seeing a New Yorker enjoying an authentic Philly soft pretzel on the streets of Manhattan will certainly be a new twist.